Every industry benefits from learning-by doing (LbD). Learning effects reduce production costs and increase the quality of products by acquiring experience, better organising tasks and sharing knowledge. In the photovoltaic solar panel sector, in just a decade LbD has led to a spectacular drop in cell costs. But it has also caused much of the manufacturing business to be transferred to Asian countries. Manufacturers know that they can count on their market opportunities growing to trigger economies of scale, in turn driving increased demand in a virtuous circle generated by the lower costs and improved quality. A prime example of this is Moore’s law for microprocessors. 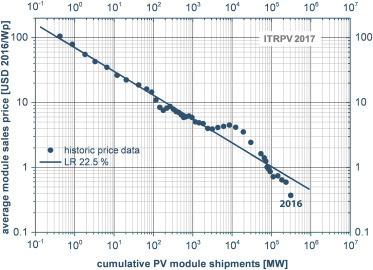 For photovoltaic modules, we can see in the attached graph the decrease in the average module manufacturing cost as a function of cumulative global production. The average learning rate (LR) is 22.5% over forty years, meaning that on average the production cost decreases by over 20% every time global production doubles. Given the advantages of this mechanism for society, public authorities rarely resist the temptation to prime the pump, either by encouraging the reduction in costs through R&D aid, or by supporting the demand for the products in question. Through various laws - the POPE law in 2005, followed by the energy transition for green growth law (LTECV) in 2015 - France has set a high renewable energy penetration target: in 2030, 32% of the gross final energy consumption, with 40% dedicated solely to the production of electricity. To achieve this, the authorities have chosen the option of feed-in tariffs for electricity and, more recently, additional remuneration on top of market prices. The idea is to enable the owners of PV systems to sell their electricity at an advantageous price, encouraging farmers, companies and households to install solar panels on their roof or land they own. By inflating the demand for PV systems, we are pushing manufacturers to increase their solar panel production in existing factories and to invest in new factories, triggering the virtuous process described earlier. If we consider that the aim is to increase electricity production from renewable sources (everyone seems to have forgotten that the real aim is to reduce greenhouse gas emissions) this operation is a great success. But behind this success are a couple of serious snags. The first is its cost. According to France’s Court of Auditors, it turns out that the aid provided by the State is completely out of proportion with the contribution to the photovoltaic growth targets. The guarantees granted before 2011 represent €2 billion per year until 2030 for an output equal to 0.7% of the electricity mix. The second snag is the industrial restructuring caused by the series of cost reductions linked to the increase in production. Because the more we produce the more we lower future costs, in sectors where LbD is prevalent competition is fierce. The perfect outcome for companies is to crush all competition and become a monopoly. If needs be, companies will sell at a loss to win market share and recover their losses from this dumping policy later. From a societal point of view, it doesn’t matter who wins this frantic race because the result is a drop in costs, and therefore a drop in prices, leading to more solar panel systems in line with the green policy. But, in the end, the losers of the race are European (and US) manufacturers, and the resulting factory closures lead to redundancy programmes in Western economies. Currently, Asian manufacturers account for 90% of the global PV module market. In the EU, the only countries where you can still find manufacturer-integrators are Germany and France, and most of them are in difficulty. Let’s not forget the demise of German company Q-Cells in 2012, the former world leader for cells and, in the same year, the French government’s request to EDF to save pioneer Photowatt. Faced with this extermination, in June 2013, the European Commission introduced protectionist measures against Chinese solar power. Officially, this was to combat subsidies from the Chinese government for solar panel exports and price dumping by Chinese manufacturers. Following a review procedure, these taxes were phased out on 3 September 2018. The disappearance of anti-dumping measures should make installers happy, as they will benefit from a rise in demand once the equipment prices go down. The situation is the same in the US, where solar installers are asking the Trump administration to remove taxes on imports (The Economist, 8 October 2017). In terms of employment, it has to be admitted that installers put forward some very good arguments. What is more, installation and maintenance are local activities with travel constraints that restrict competition. So the breakdown of tasks with “Asian manufacturers and European installers” could satisfy most policymakers, especially local public authorities that see it as a way to boost the economy in rural areas. The policy of demand-side subsidies for PV panels via feed-in tariffs and the subsequent LbD were therefore accompanied by the closure of factories in Europe. However, it is not clear whether there is a causal relationship between subsidies and closures. If the costs for several companies go down without there being a significant difference between these costs, the companies can remain active on the market. But to ensure there isn’t any exclusion, certain conditions must be met. Firstly, the companies cannot be at overcapacity, because when there is overcapacity of an undifferentiated product on the market the only weapon you have is the price (Bertrand competition) and the trade war causes prices to drop to the level of the least profitable companies. If they have sufficient production capacities, the best performing companies eliminate all the others. This is the current situation: there is a global overcapacity and only tariff barriers to trade are slowing the eviction of the smallest manufacturers by the Asian giants. If, on the other hand, the production capacities are used fully, the way the companies compete is through the quantities delivered to the market (Cournot competition) and a diverse group of companies can coexist, with different profit margins since the price is the same while the costs are different. However, even in this situation, if certain producers don’t manage to reduce their costs below the oligopoly equilibrium price their operating losses will force them to close down. The potential for certain companies to go bust due to LbD is undeniable. What is less certain is the role played by feed-in tariffs - the subsidies meant to stimulate demand for solar panels - in this process. The first effect of subsidies is to increase buyers’ willingness to pay, potentially helping small competitors to stay in business. But, once the process is underway, the end result depends on the initial production costs, the learning rate, spill-over effects (copies and imitations), interest rates, and even the curvature of the function linking the price to the required quantity. There are also other public interventions that can be disastrous. In particular, if governments that realise they have been too generous decide to reduce feed-in tariffs, the demand for panels goes down and we end up in the overcapacity situation we explained earlier. This is what is currently happening in China where the government has decided, without warning, to drastically reduce regulated feed-in tariffs for new installations and to no longer approve new solar plants until the end of the year. (Les Echos, 3 July 2018). As the Court of Auditors said in March 2018, “... having failed to establish a clear strategy and stable and coherent support systems, the French industry has gained little from the development of renewable energies.” It is likely that the governments which counted on feed-in tariffs hoped that national, or at least European, leaders would appear. They forgot that, in a globalised market, buyers go where the products are the cheapest. Rather than feed-in tariffs, financing provided to R&D programmes would have taken more time to achieve the objectives set but it could have targeted solely European companies. It is rare that a single economic policy instrument can be used to achieve several objectives. Feed-in tariffs have proven to be a good environmental policy tool (if we consider that reducing CO2 emissions is not a priority) but a bad industrial policy instrument. Court of Auditors, “Le Soutien aux énergies renouvelables” (Support for renewable energies), Report to the finance committee at the Senate, March 2018, https://www.ccomptes.fr/sites/default/files/2018-04/20180418-rapport-soutien-energies-renouvelables.pdf. According to Ademe, French companies positioned on segments other than solar system cells and modules are seeing good results in terms of integration and system management. Across the whole chain, the French added value of PV systems is estimated at 44%. Source: ADEME “Filière photovoltaïque française : bilan, perspectives et stratégie” (French photovoltaic sector: overview, perspectives and strategy), December 2015. For a micro-economic analysis of this case, see C. Bobtcheff, C. Crampes and Y. Lefouili (April 2018), “Demand Shocks, Learning‐by‐Doing and Exclusion", https://www.tse-fr.eu/sites/default/files/TSE/documents/doc/wp/2018/wp_tse_911.pdf. October 02, 2018Will LNG Canada increase greenhouse-gas emissions? It’s complicated.